I like pictures of fire, and I know how difficult they are to take. There are many more misses than hits, at least in my experience. But this is just simply one of the best I've ever seen. It's from National Geographic and was shot in Jammu, India. Devotees of Sikhism, the world's fifth largest organized religion, were marking the 342nd birthday of Guru Gobind Singh, a founder of the faith, in July. 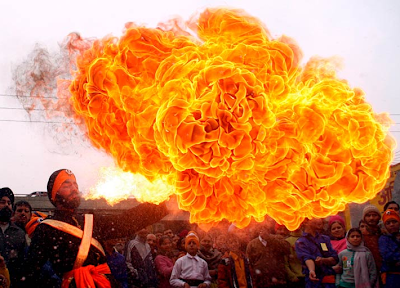 The photo was taken by Jaipal Singh and distributed through EPA/Corbis. The photographer has a photostream on Flickr, where he posts a lot of his photojournalism work. The next iteration of Nikon's awesome D3 digital camera was announced today, and it's a stunner. 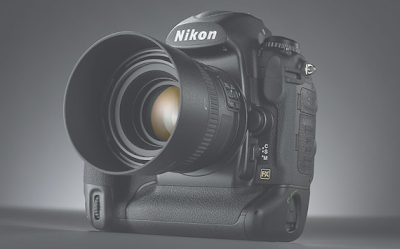 Full-frame sensor, 9 frames per second and an expanded ISO range that goes up to ... 102,400. Not a misprint. An ISO range in the six figures. Oh, and HD video, too. Of course, the rig also has Nikon's superior autofocus system, which features 51 autofocus points and 15 crosspoint sensors. So you'll actually be able to use your autofocus in the incredibly low light that ISO 102,400 will open up. The press release blather says the camera might see in the dark better than you do; in this case, the blather might be right. Interestingly, the megapixel count is down from the D3x, from about 25 to 12. But each pixel holds more information, making the incredible ISO rating possible. Just as interestingly, the price is lower than the D3x, too. The D3s will run about $5,000, with the D3x still up there at more than $8,000. I'm looking at my twin Canon 5Ds now and asking myself, "why?" A complete writeup from PRNewswire is available here. Polapremium made two significant announcements on its website today for everyone who loves instant photography and everyone who loves Polaroid: The camera company has decided to get back into the instant film business and will be producing brand new One Step cameras, and they have commissioned the Impossible Project to produce Polaroid-branded film in the middle of next year. Large-scale production and worldwide sale of The Impossible Project's new integral film materials under its own brand will already start in the beginning of 2010 - with a brand new and astonishing black and white Instant Film and the first colour films to follow in the course of the year. 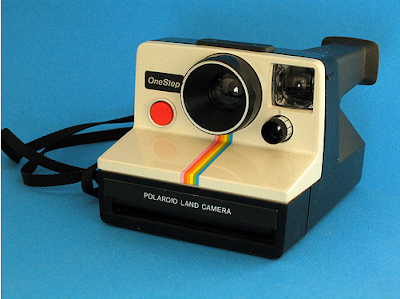 The fledgling efforts to re-create Polaroid film always seemed to me to be, indeed, an impossible project, but it's a dream that's apparently going to come true.